Computer Programming is the art / process of writing computer programs/ software / Applications. You will mostly hear people refer to it as writing code. A person who writes programs is called a programmer / developer / coder and a bunch of other names . Programming is a good skill to posses. You can make money from your skills. Or you can use your skills to build things that will make your work easier. Or you can use your programming knowledge to build your own business ideas. What are some reasons why learning to code will be useful to you? Let’s look at these reasons and you shall decide if coding is a good skill to have. The more you learn the more your learning capability grows. When you learn programming it helps to expand your brain and your learning and skill solving capabilities also improve. Keep your brain active by solving programming problems and puzzles . Coming up with your own solutions to some problems you face is always a fun process. Once you learn to code, you will always have the fun option of creating your own solutions to things. Instead of making do with the available options. At least it gives you a choice. One of the biggest challenges most non developers face is trying to get their idea off the ground. Wouldn’t it be great if you could build your own startup and bootstrap it from the ground. If you can code, you can build your prototype. Build the initial Minimum Viable Product. And just get it out there . Then you can improve it as people use it. Whatever it is. And when you grow, you can decide to hire other people to handle the coding stuff so that you can build the business. As a technical person, it will be easier for you to hire the right developers. And you will not be taken advantage of. Learn programming and code your own Startup and bootstrap your own startup. I bet this sounds really enticing if you are introverted and find it hard to seek partnerships. What can I say? If you can code. There are people who will pay you to build stuff for them. If you become really good, you can choose your own clients. And only choose projects which are appealing to you. And the good thing about being a programmer is, you can work anywhere in the world. If you want to be a digital nomad, you can travel around the world and just work remotely with your clients. It all takes time. You should be patient and continue learning . Learn about coding and you can work and earn money from anywhere you like. Yes ! You can learn. That is a good reason to start. Keep doing it and you will become more comfortable and better. The reason most people give up is because they want to learn everything. It becomes overwhelming then they quit. Don’t be like that. Choose one programming language. And stick with it. Until you become subconsciously good in using and programing in it. You can learn programming. You just need to be consistent. 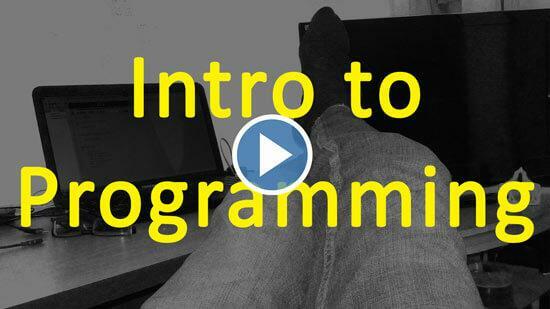 This introduction to programming course is divided into chapters on SkillShare. By the end of this full course you will be able to comfortably learn any programming language you choose. Start from the first chapter and go all the way. Bear in mind that, I will be there to help you throughout the journey. I will be there to assist you when you need any help. Premium skillshare members, join this class using the button below. New SkillShare members, enter your name and email and you will get access to this introduction to programming.